This photo is one of several in our collection featuring Native Americans. 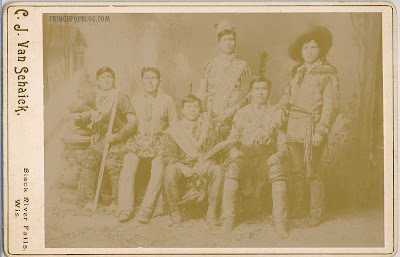 Having taken all of the Indian Law classics available at our law school and having become very close friends with the handful of Natives at our law school, we started taking a special interest in collecting these photos. They really came alive after we began to learn extensively about the laws governing Native Americans and their historical context. Sovereignty. The discovery doctrine. Countless illuminating legal cases. I could go on and on, but I won't, as this isn't the place for it. This particular photo features a group of Natives from the Black River Falls area of Wisconsin. Their tribal affiliation is Winnebago, and they were part of a delegation in support of the Spanish-American war. This photo was taken by C.J. Van Schaick, the notable Black River Falls photographer whose work is featured in both the movie and book "Wisconsin Death Trip." If you don't know about the book/movie, please check it out. Google it. Do whatever you can to get a copy of each. I will write more about C.J. Van Schaick and "Wisconsin Death Trip" in a future post.